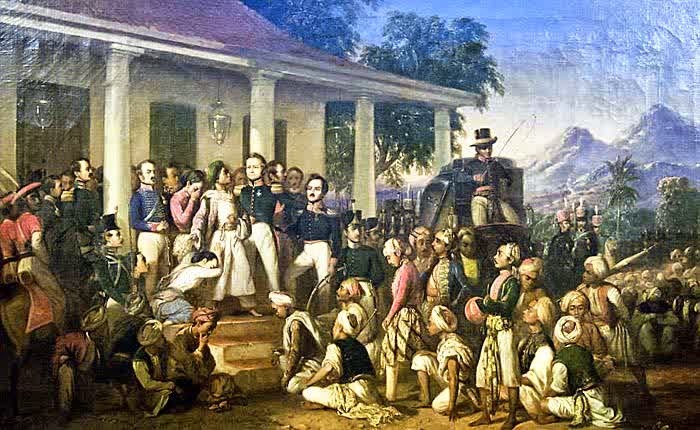 The Java War of 1825-30 constituted the last resistance of the Javanese aristocracy to Dutch rule. Its central figure was Pangeran Diponegoro (ca. 1785-1855), eldest son of the sultan of Yogyakarta. The immediate cause of Diponegoro's revolt in 1825 was the Dutch decision to build a road across a piece of his property that contained a sacred tomb. The Java War was not a modern anticolonial movement. The Java War gave considerable impetus to a conservative trend in Dutch colonial policy. Java was divided into a number of residencies, each headed by a Dutch chief administrator; each of these was further subdivided into a number of regencies that were formally headed by a Javanese regent assisted by a Dutch official. The struggle waged by Prince Diponegoro (1785-1855) of Yogyakarta, a city in central Java (now part of Indonesia), from 1825 to 1830 was one of the most important turning points in the political history of nineteenth-century Java, and of Javanese history as a whole. The Java War, also known as the Diponegoro War, determined the increasing glory of Java’s colonial government and the inevitable retrenchment of local powers. From the Javanese perspective, the Diponegoro War was the end of the Javanese effort to combat colonial intervention and restore the greatness of Java, a greatness tattered since the coming of the Verenigde Oost-Indische Compagnie (VOC, or Dutch East India Company). The war can also be seen as the first major war against the Dutch involving Javanese leaders who were motivated by social and economic reasons, rather than the usual dynastic reasons that had caused earlier conflicts in Java. After the Diponegoro War, the kingdom and society of Java become a highly dependent subject of the colonial realm, not only politically, but also socially, economically, and culturally. The defeat of Diponegoro placed the Javanese solely and definitively under colonial control, forming one of the bases of the Pax Neerlandica. This situation placed the Dutch in a central position in determining everything that occurred in Java after 1830. The reappointed Sultan Hamengkubuwono II, after being forced to resign by the French-Dutch representative, enjoyed only one year of rule. The British had earlier asked Diponegoro to accept the title of crown prince, but he declined. The British government then appointed Prince Jarot, or Raden Mas Sudama, the son of the official wife of Hamengkubuwono III, as Hamengkubuwono IV, sidestepping Diponegoro, who was the oldest son of Hamengkubuwono III from an unofficial wife. Diponegoro became the main critic of this clique. The sultan died in December 1822, and Yogyakarta was handed back to Dutch control. In exchange, the Netherlands Indies government appointed Prince Menol, a three-year-old child, as Hamengkubuwono V. Diponegoro and three other distinguished personages were appointed members of the prince’s guardianship. Danurejo worked closely with the colonial government and was hostile to Diponegoro. The situation became more complicated with the appearance of Dutch resident Smissaert, whose attitude offended the complicated Javanese rules of etiquette and customs. This situation was frowned upon by many kraton (palace) courtiers, who continued to uphold traditional Javanese values. Tension was heightened further as the Javanese people began to throw their support behind Diponegoro. The leasing of appanage land owned by families of the sultan and the Javanese aristocracy to Europeans and Chinese started during the British period in 1814, and was continued by the Netherlands Indies government. At the same time, the introduction of a land-tax system by Stamford Raffles (1781-1826), along with the government’s practice of administering tollgates by subcontracting through three to four Chinese tax-farmers, created more tension because the abuses of the traditional services system by local Javanese officials had continued. People saw Diponegoro as the reincarnation of the mythical ratu adil, the ”just king” in Javanese millenarian tradition. In the eyes of the Javanese people, Diponegoro not only brought hope to nativist Javanese, but he also represented the idea of perang sabil, or holy war within an Islamic frame. Beginning in 1825, the policies of the colonial and sultanate elite did increasing damage to Diponegoro. The event resulted in a spontaneous mobilization of people to defend Diponegoro’s rights in mid-July 1825. A day later, Smissaert sent an army of fifty men and two cannons to capture Diponegoro. Tegalrejo was destroyed, and Diponegoro retreated to the south, through Selarong, which then became the center of the struggle and the place where Diponegoro declared himself eru-cakra, another name for ratu adil, the just king. Many areas in the Surakarta sultanate became battlegrounds for the war, as many local people and elites chose to support Diponegoro. The widespread support of the Javanese people for Diponegoro cannot be underestimated. The war in Java prevented the Dutch from continuing their political and military expansion elsewhere in the archipelago, especially in islands outside Java. A new approach known as the Bentengstelsel was then implemented to corner Diponegoro. Diponegoro decided to stop the war in February 1830, and he commenced with negotiation. Diponegoro was invited to the Dutch resident’s house in Magelang on March 8, 1830. Diponegoro was later transferred to Makassar, South Sulawesi, where he remained until his death on January 8, 1855. During his years of exile, Diponegoro produced many works of literature on Java and Islam. 0 Response to "Pangeran Diponegoro & The Java War"